If you take the bus in Buenos Aires, which you should do sometime, you will have discovered that some of the bus stops are hard to find. Some bus stops, like for the #10, are indicated by no more than a little sticker slapped on a utility pole. Over the last year I’ve been observing this bus stop sign that is being slowed enveloped by a tree. Earlier this month I finally got around to taking a photo. Actually, I don’t think that this stop is still in service. It’s on Av Chile near Puerto Madero and just around just around the corner from an interesting set of abandoned buildings that Robert talks about over at line of sight. Look closely at the top of the sign and notice how the tree is pushing the letter “R” off the sign. This is why I started the City that Fades Away series. Architecture is one of the distinguishing aspects of Buenos Aires. I’m perplexed whenever characteristic structures are demolished for replacement by new, bland apartment buildings with such little sense of style. There’s a new hotel that has been going up over the last year near Puerto Madero. It’s not on the level of competing with the Hilton or the Faena but could offer business travelers an alternative. The hotel is situated not quite in Puerto Madero but at the corner of Chile and Azopardo, which is not a bad tree-lined area. The oddest thing about the hotel is its name: Hotel Park Plaza K.
Plaza K? In Argentina these days most people associate “K” with Kirchner. Maybe the K stands for Kempinski, the hotel chain, but it seems a strange choice for a hotel name in Argentina. I never tire of walking down Av de Mayo. Even though I’ve walked the avenue many times, I always gain a new perspective. Perhaps it’s just observing the porteños wandering back-and-forth or the way the day’s sunlight strikes the outstanding architecture. Along the 1300 block the Barolo pulls my eye up towards its heights, then my gaze drifts over to admire La Inmobiliaria. I’ve repeated this pattern dozens of times over the last few years. Yesterday I did a double take, as for the first time, I noticed these gleaming figures atop La Inmobiliaria. For the last couple of years the building has been undergoing a slow renovation. Usually I’m focused on other aspects of La Inmobiliaria, like its distinctive red cupolas or the loggia. I have never noticed the shiny naked guy as much as now. From what material are these statues made? From a distance, so bright, it seems like bronze or were they covered with some metallic paint? I’m curious, especially when comparing the other statues on the same building. On the front of the building you’ll find the same pair, same pose, but this time not looking so happy and shiny. Supposedly, the pair are Apollo and Venus. The corner facing Congreso was refurbished some time ago but this pair didn’t get the bronzer. This time she’s naked and he’s dressed. Look closely and notice how the two are coyly admiring each other. What’s going on up there? Yet another mystery as to why an old wagon is sitting in front of this house in Barracas….just another one of those daily sights that make Buenos Aires such a great city to explore. Nothing outstanding to say here. I just liked the looks of these buildings. I came across this photo taken by Esteban Diacono (who, BTW, has some great photos) the other day when I was browsing through Flickr. But, I’ve seen this guy before late one Sunday night when Ceci and I were sitting in La Academia on Callao. He was dressed exactly the same but without the hat. Then he got up to leave and, with a flick of the wrist, out came the top hat! I hadn’t seen him since, so it was a fun surprise to see this photo on Flickr. The guy looks like quite a character so I was just wondering if anyone knew his story. Few people venture along the side streets behind Constitución station but there are some pleasant surprises (and I’m not talking about the transvestite prostitutes, though there are indeed plenty of trany hookers – or is the word “transy”?). If you walk around the area on a bright sunny day you’ll see that it’s not so bad, hardly the red light district that some imagine. There’s actually some interesting architecture in the area and this post continues my series on the city that fades away. This photo, taken late last year, is of a building facade on a street named 15 de Noviembre de 1889 that starts just behind the train station. Over the last month as I’ve been walking down Defensa in San Telmo I’ve felt that something was different, something was missing, but I couldn’t quite figure it out. 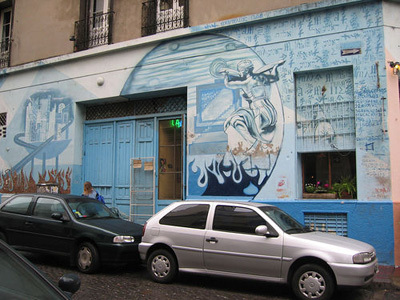 Then I remembered that there was once an intriguing blue wall with some wonderful lettering on one street corner. Where did it go? Was I just missing it? I kept walking up and down Defensa trying to figure out the spot. 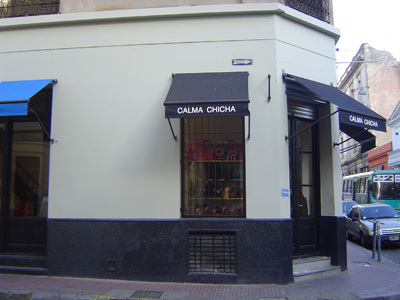 Then I realized that there was this new Calma Chicha store in San Telmo with an exterior wall that suspiciously looked freshly painted. Welcome to Palermo Telmo ….. Things change. 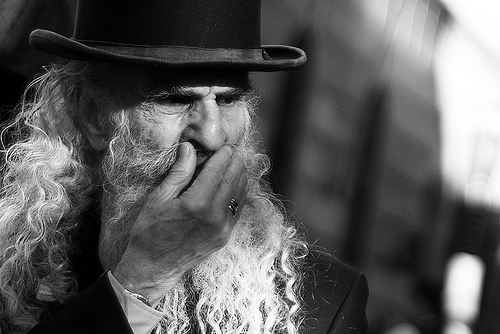 That’s the importance of photographs and documenting the city as it is now. I went through my own photo archive to see if I had a pic of the old corner. I always had intended to take a photo of it but evidently never did. But surely someone had done so. Thus I searched through Flickr for photos tagged San Telmo. After browsing more than 1,500 photos (!) I came across this photo. Thank you Salim Virji for noticing this mural.